Hakumei.net Portfolio | Orthodontic Care Specialists Ltd. 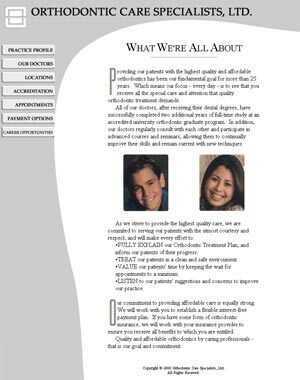 In 1999 Orthodontic Care Specialists asked me to build them a simple website so potential clients could read about their practice online and get some basic information on the orthodontic process. They gave me some print materials with the information they wanted online, so I designed the site to match their brand identity at the time. Over the course of a year or so I made small updates to the page for them. In the fall of 2000 I left for Japan for a year of school, at which time they hired another designer to continue the updates. My original site no longer exists as eventually he changed the whole design (though some of my original design elements barely show through). I've put up my original design here so it is available to view. When viewing this site, bear in mind it was made in 1999 when I was first learning this stuff. I actually used arcane HTML frames to make it. To say they are now frowned upon would be an understatement. But in the spirit of archiving, I make this somewhat poor example of web design available. Enjoy!